Brother JT returns to Columbus! 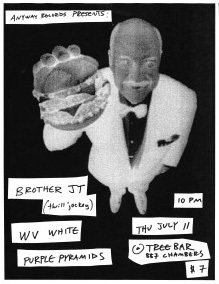 After about 12 or 13 years, Anyway is proud to welcome Central Pennsylvania’s finest rock & roller, Brother JT back to Columbus this Thursday, July 11, for a show at the Tree Bar. Thrill Jockey put out his new record, and we can’t wait to see him play again! Local faves WV White and Purple Pyramids round out this amazing bill. Show starts at 10pm!